It is not yet clear whether reconciliation in Afghanistan is possible. But what has become increasingly clear is that certain critical elements must be addressed and overcome before any semblance of longterm stability in Afghanistan can emerge. This report is structured into three main sections: 1) contextualizing the current pressure toward reconciliation in terms of what Afghans want, 2) breaking down a potential negotiated settlement into its essential component parts, and 3) looking at some of the spoilers that make this process particularly difficult in Afghanistan. This report does not seek to establish the ground truth from an objective perspective—such an effort is not possible in the context of competing interests of stakeholders both inside and out of Afghanistan. Instead, it seeks insights from leading experts from a variety of viewpoints that hopefully lead to a more nuanced understanding of the critical paths and roadblocks to a grand bargain in Afghanistan. In Chapter 1, Dr. Barnett Rubin, Senior Fellow and Associate Director of New York University’s Center on International Cooperation, outlines the historical dimensions of great power competition in Afghanistan starting with the Great Game and ending with a pessimistic view of a potential grand bargain. He argues that the perceived US intent to establish permanent hegemony over Afghanistan since 2005 has revolutionized the strategic balance in Eurasia, putting regional stakeholders further at odds with the United States. As an “offshore power in [relative] decline” and without a single cooperative relationship with regional powers (China, Iran, Russia, or Pakistan), stabilization is unlikely. The result is a balancing act in which the states of the region, in accord with their differing interests and capacities, try to assure that the US neither consolidates its position nor leaves abruptly. In Chapter 2, Dr. Thomas Barfield, Professor of Anthropology at Boston University and President of the American Institute for Afghanistan Studies, notes that the biggest obstacle to a negotiated settlement in Afghanistan is the highly centralized, monopolistic government that has characterized all national Afghan governments since the late 19th century. 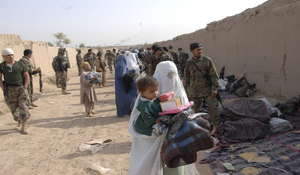 Now at a hurting stalemate, Taliban fighters, the Kabul government, and the population are increasingly tired of war. A “grand bargain” in Afghanistan would entail changing the constitution so that power between the center and periphery is shared as was the case when kings ruled from Kabul over regions that held a considerable degree of autonomy—not unlike the United States. Regardless, any effort that does not account for the will of the Afghan people will not succeed. In Chapter 3, Dr. Homayun Sidky, Professor of Anthropology at Miami University, questions whether a resolution to the conflict in Afghanistan is even possible given US missteps in the region. These include no coherent US strategy, support for what many see as an illegitimate central government, pushing democratic governance, and not doing enough to support multi-ethnic representation in governance. Complicating these issues are Afghanistan’s dependence on foreign aid, a failing economy, and unrestricted opium cultivation. In a society that is tired of war—and of both the central government and the Taliban—perhaps the only way forward is through a federated system of governance. In Chapter 4, Mr. Raffaello Pantucci, Director of International Security Studies at the Royal United Services Institute, discusses China’s potential role in a negotiated settlement. With the view that Afghanistan is the graveyard of Empires, China’s main priority is to establish workable relationships with as many regional stakeholders as possible to ensure that their own economic and security interests are covered. China lacks the power many ascribe to it to bring Pakistan and the Taliban to the negotiating table. While China is not adverse to a negotiated settlement, it will only invest in the effort once it is clear it is going to work and that all the other actors are on board. In Chapter 5, Mr. Sher Jan Ahmadzai, the Director of the Center for Afghan Studies at the University Nebraska at Omaha, addresses demands to rewrite the Afghan constitution. He notes two groups that are calling for reform: those that want a more decentralized form of government and the Taliban, which claims that the constitution lacks Islamic values and norms. Mr. Ahmadzai fears that rewriting the constitution will exacerbate political instability and instead advocates for revising the constitution gradually through existing mechanisms. With regard to elections, Mr. Ahmadzai emphasizes the importance of holding elections, even if they are imperfect. However, he suggests that electoral reforms should better take into account traditional Afghan ways of choosing their representatives and leaders. In Chapter 6, the US Training and Doctrine Command G27 Models and Simulations team describes how its Athena course of action analysis tool assesses the political and social effects of a potential power sharing agreements in Afghanistan. The team found that both of the power sharing structures studied—power shared at the ministerial level versus a decentralized regional government structure—resulted in increased Afghan governmental control geographically as well as increased popular support for the government. While the latter structure was a superior outcome in both control and population support, it comes with a potential downside. Recent Afghan history has shown that regional leaders often chafe under centralized control and will not hesitate to ignore the national government at best or plunge the country into civil war at worst. In Chapter 7, Mr. Vern Liebl, analyst at the US Marine Corps University Center for Advanced Operational Culture Learning (CAOCL), paints a somber prospect for settlements that involve sharing power with the Taliban. The primary obstacle is that the Taliban is not willing to compromise on its prime objectives of expelling all foreigners and the reversion of governance completely into its own hands. Furthermore, he warns that ceasefires should not be read as a symbol of hope but as a tactic used by the Taliban to further alienate the National Unity Government. Finally, while Afghans largely want an ethnically representative and pluralistic state, they lack a unifying and charismatic leader that could lead such a movement. The preponderance of the evidence in Afghanistan suggests that a grand bargain is an unrealistic expectation at this time. In Chapter 8, Dr. Karl Kaltenthaler, Professor of Political Science at the University of Akron and Case Western Reserve University, describes Afghanistan and Pakistan as locked in a complex security dilemma, which leaves Pakistan with little interest or motivation to support a negotiated settlement. Amongst Pakistan’s concerns is rising Pashtun nationalism, encirclement by India, and persistent US presence in the region. In fact, Pakistan has many reasons for intransigence in regard to any effort that moves Afghanistan in the direction of reconciliation. In particular, Pakistan fears that even a reconciled Afghan government would not be strong enough to control anti-Pakistan groups in the country. Pakistan’s best strategy remains strategic patience as it waits for the US to eventually withdraw. In Chapter 9, Dr. Gina Ligon and Mr. Michael Logan, University of Nebraska at Omaha, conducted a study of fragmentation and consolidation within violent extremist organizations (VEOs) within Afghanistan. By looking at periods of instability—defined by high of violence—in Afghanistan, Dr. Ligon and Mr. Logan found that three factors likely drive this behavior: organizational uncertainty, fractionalization, and consolidation. This has implications for successful counterterrorism strategies. With regard to organizational uncertainty, counterterrorism efforts like decapitation increases friction between group members as organizational influence and control is delegated from senior leaders to foot soldiers. Fractionalization occurs when new VEOs emerge from inter-group rivalry after the death of a senior leader. Consolidation occurs when new VEOs emerge (e.g., ISKP) and threaten the preexisting extremist organizations. A follow on study will evaluate how changes in leadership impact regional stability. In Chapter 10, Dr. Craig Whiteside, professor at the Naval War College at the Naval Postgraduate School, discusses whether Islamic State Khorasan Province (ISKP) could act as a spoiler in any potential reconciliation effort. While ISKP could make gains that destabilize the region—by making gains in northern provinces, which could motivate Tajikistan or even Russia to intervene by aiding the Taliban OR by becoming popular among the youth in Kabul, driving urban terror—the greatest threat ISKP poses is in its potential to draw in disaffected Taliban. This could be particularly relevant if the Taliban enters into talks with GIRoA. While ISKP remains a low risk threat in the region, a worstcase scenario would be a large swing from the Taliban to ISKP. In Chapter 11, LTG (ret.) Daniel Bolger, professor at North Carolina State University, concludes the white paper with an essay opining that while the US may prefer a grand bargain, the ugly reality is a choice between open-ended stalemate and outright withdrawal. He notes that Afghanistan has a warfighting culture that will never accept foreign interventions. This encourages strategic patience on the Taliban’s part to continue the insurgency and reject any form of negotiated settlement. Prospects for stability may be outside the capacity of the USG to facilitate.